Bax is famous, that won’t come as a surprise to you. 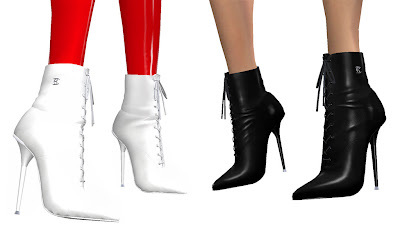 So it was a pleasure to discover her latest design : leather ankle boots. But while there’s no law that says you can’t wear patent boots with leather pants.. let’s say I’m really, really happy to see those lovelies. Bax is always a joy to chat with. And despite our large time difference, I manage to catch her now and then. She mentioned she’ll be upgrading her older ankle boots to match the new developments in these (v1 and v2 compatibility, removable scripts) in the next few days. Just drop by the store and visit the update station. PS : Our studio lighting and white background don't do justice to the white boots - the texture is detailed and gorgeous, go see for yourself! Bax is back with some improvements on her ankle boots, Mistress almost lives in her old ones so she jumped at the news. The first change is the texture, instead of the patent leather of the old you now get lovely soft looking leather. The other and bigger change is in the scripting, she has reworked the scripts to make them work more smoothly. Another feature of the script is that there is an option to remove the used scripts from the boots, sim owners will love you for that, tip from Bax “make backup copies of your boots, that’s why I made them copy”.